How does one make sense of the various political and economic ideologies in the world today. They seem to be ambiguous at best and many people try to think of themselves as independent thinkers, but that is hard. What kind of government or economy would you prefer. This quiz is by no means exhaustive, but it divides up where certain viewpoints stand on particular issues quite nicely. You may learn something through this quiz. Do you believe harmful drugs should be legalized? Yes, but with heavy taxes. Yes. There should be no laws against drugs. Drug smugglers and kingpins deserve the death penalty. Yes. They can be sold as a luxury item. Should the government provide welfare money. Yes. People going through a hard time should be helped by the government. Only if they are can't work, or are working, but don't make enough to live on. Never. Let them figure out how to survive. We should try to distribute money evenly among the people. Money is not all the government can offer. Social programs should be enacted as well to meet the needs of the citizens in all aspects of life. No. The State should not make that decision. Yes, and also for enemies of the State who are a threat and plan to commit violent crimes. Should the government regulate industry? Never. Free trade at any cost. Yes. There should be no private enterprise at all. Only vital industries, and not by the government, but by councils made of people from differents parts of that industry. Yes, to protect the employees. No, and we should break up labor unions. Yes, to increase corporate responsibility. Do you believe in an absolutley free press? Yes. Let them say whatever they want. No. The government should control all forms of multimedia. Harmful material should be censored. Lies should not be tolerated in the media. Yes. Let the people rule. No. Democracy is simply mob rule, and is easily exploited. Yes, but should be forced to be fair. Yes, but it should be more of an elitist republic. Yes. Everyone should be forced to vote. If your nation is powerful, should it seek an imperialist policy? No. Leave other nations alone. In fact, help them. We should help insurgents in other nations who agree with our goals. Help our ideology to spread. Economic imperialism. Exploit their economies for cheap labor for our corporations. We should try to expand our nation by political and military means when we have proper justification. Should the government use public surveillance and profiling to foil terrorist plots? Never offend anyone by profiling or invading their privacy. People should be willing to be a little inconvenienced for the protection of our nation. Do you believe in a draft for national defense? Yes, but only in times of war. What is your opinion of the class struggle? We must support the working class against their economic oppressors. Survival of the fittest. What is good for the rich will trickle down to everyone else. Successful people tend to have something inherently more valuable about them. Let's stop favoring either side of the class struggle. We need class cooperation. Everyone must work for the good of the nation. 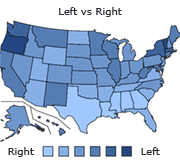 Quiz topic: What political ideology do I have?